At Island City Dental, we offer patients a wide range of preventive, restorative, and cosmetic dentistry services. We partner with patients to keep their smiles whole and healthy, but there are some situations where dental damage or decay can’t be avoided. In these cases, we provide restorative dental care to replace lost structure and ensure healthy function. 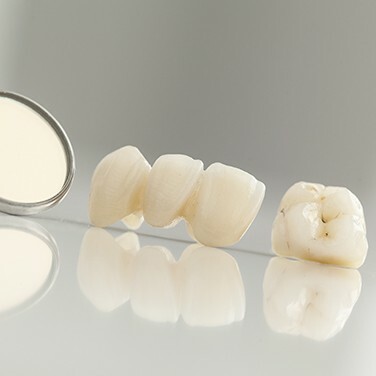 Dental crowns and bridges are some of the most commonly used restorations we provide. If you want to learn more about crowns, bridges, or any of our restorative dentistry services, call our Fort Lauderdale dental team today. We will be happy to answer any questions you may have or schedule an appointment for you to visit Island City Dental. When a tooth becomes damaged, Dr. Smith or Dr. Yap may recommend a crown. 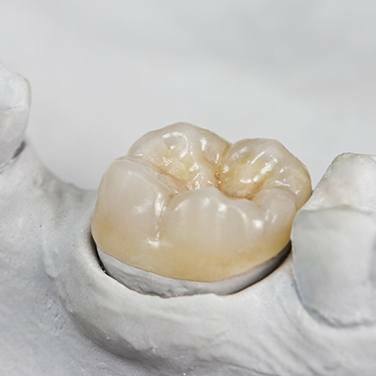 Made of porcelain, porcelain, and metal, or all metal, a crown is a custom, lab-made restoration that fits snugly over a damaged tooth. While fillings can repair some cavities, larger cavities, chips, cracks, and replacing old dental work may require a crown. When possible, your dentist will place a white crown to keep your smile looking natural and beautiful. First of all, a bridge is a prosthetic tooth (or teeth) that attaches on one or both sides to teeth prepared with dental crowns. A fixed bridge is permanently fused onto the neighboring abutment teeth (crowned teeth) and consists of three basic units: the false tooth or teeth (called a pontic) and two abutment crowns. The style of bridge we recommend will depend upon the strength and health of the abutment teeth, as well as the location of the gap in relation to the rest of your dentition. If healthy adjacent teeth aren't available, a surgically-implanted metal post, known as a dental implant, may offer a solid alternative. For a bridge that replaces many teeth, we may recommend a removable partial denture or implant-supported prosthesis. With proper care, a fixed bridge may last 8 to 10 years. If you've lost teeth due to accident, injury, or gum disease, we can create a permanent bridge to restore your solid smile. A bridge not only fills the gap, but it also prevents repositioning of remaining teeth. 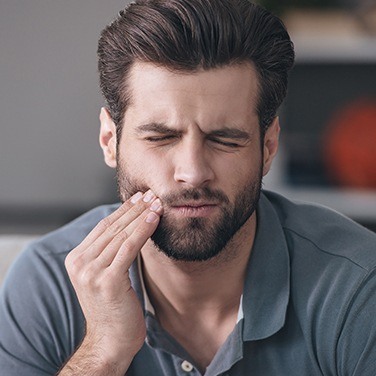 This replacement can correct a misaligned bite, improve chewing function and speech articulation, and provide internal structure for the face to give you a more youthful appearance. It will take two visits to place your crown or bridge. At your initial appointment, we'll prepare your tooth, make an impression for the lab, and attach a temporary restoration to your tooth. The impression will be sent to our local dental lab where your crown or bridge will be fabricated. After your custom restoration arrives in our office, you'll visit again so that the dentist can remove your temporary and place the final restoration. If necessary, we'll make slight adjustments to ensure a proper fit. Following the placement of your dental crown or fixed bridge, you should continue your regular oral hygiene routine. Use soft toothbrushes and minimally abrasive toothpaste to avoid excessive wear during your twice daily tooth brushing. 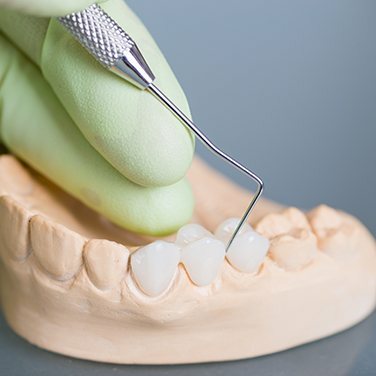 You may want to switch to using a waxed floss in order to avoid snagging on the edges of your dental crown or bridge. During six month dental exams and teeth cleanings, we’ll examine your restoration for signs of wear or damage and work with you to keep the crown or bridge in place.